I know, I know. 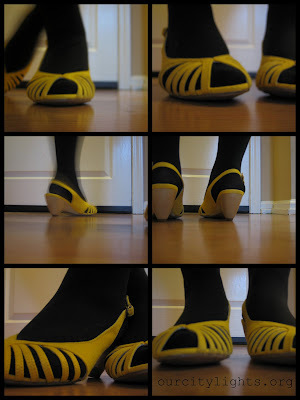 Yellow opened toed shoes with black tights. Isn't that the equivalent to men wearing flip flops with argyle socks? I still like the way they look. It's California, but still looks silly wearing sandals in this "cold" weather of 65 degrees. I wish I could show you how cute these would be with a Spring outfit, but how many times have I said I wanted Spring to be here already? Well, until that time avails, my kitchen floor will do just fine.